To contain chicks and other young poultry. Non-electrifiable. Remember to order posts! 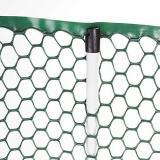 You will need 48" NetPosts or 48" FiberTuff™ Posts to install as a semi-permanent or temporary fence. 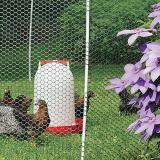 To contain chicks and ducklings when they are too small to be contained by PoultryNet. 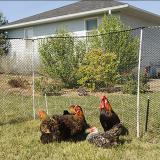 Also use to keep free-range flocks out of flower beds, gardens, patios, roadways, etc. 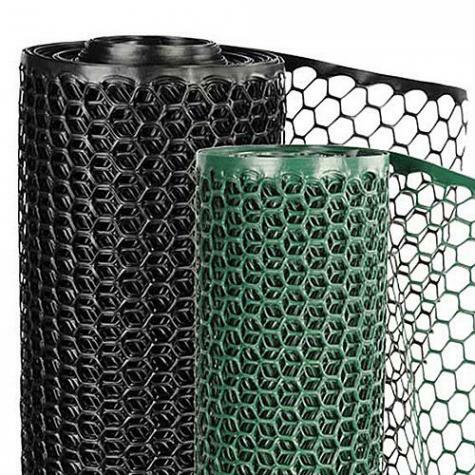 NoShock can be used either as a temporary, semi-permanent or permanent fence. 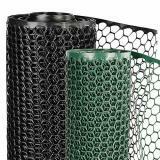 NetPosts (see accessories tab above) can be woven through the mesh every 10 ft for a temporary fence. 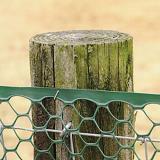 At any corner you will need an extra support post (FiberTuff, steel T post or wooden post). 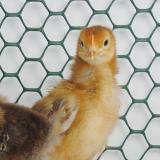 NoShock can also be stapled or zip-tied to wood/metal posts for a permanent poultry run. 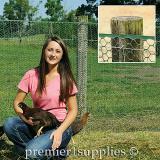 Chicks and ducklings are too small to be contained by PoultryNet. Why? The spacings at the bottom of the net are too large and the birds make a poor electrical connection (too light). That’s why we’re introducing a tighter, nonelectrifiable alternative to PoultryNet with “chick-stop” openings to keep in chicks, ducklings, etc. Great product, easy to use, putting it inside of the chicken wire I got at the local hardware store because my chicks were walking thru it. This stopped them. Thanks! I use this fencing with alternating 15/48/DS NetPosts & 22mm 48" FiberTuff double spike posts leaving about 4' in between each. It is perfect. Lightweight, strong, easy to use, inexpensive solution to keep the chickens corralled to keep our property looking neat & clean. In 6 months they had done a number on our mulched beds & every concrete surface. Thank you for your practical solutions that you've tested on your own farm. Every recommended item I've purchased is awesome. We use this netting for a perimeter around coops. This is our second time purchasing this product. We use t bars with zip ties for a semi permanent fence, with landscape pins for the bottom. Does a decent job. My only critique would be to make the fencing a bit tougher. Can rip a bit too easily. we have ordered several items for this company related to poultry. they are quick to get your order to you and we are very satisfied with our products. We are using the netting to secure the area where we can open up for our poultry to free range in a larger area.. Love the 48" by 50" black no shock netting we have. Easy to use and cut to size using kitchen shears. Exactly as advertised.doesnt quite do the job as my Australorps have figured out how to escape using a combination of fence climbing and wing flapping. Actually it's really entertaining to watch them figuring it out every day! 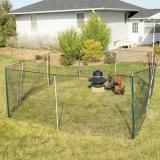 However it does keep the babies safely enclosed and the neighbors cats are afraid of the fence, even though it's no shock!